Woodbridge, United States - October 15, 2018 /MarketersMedia/ — Survival packs or bug-out bags should always be ready in case SHTF and people are left on their own to survive. Therefore, it is essential to equip one’s survival and bug-out bags with necessary supplies before the worst case scenario happens. One of the critical things to consider when preparing for the worst is the availability of a fire-making tool. Without fire, any camper or survivalist cannot function and carry out fire-related activities such as cooking food, ensuring one’s safety, and providing heat and protection against cold and wildlife. These things won’t be possible without a fire source. Surviveware, an advocate of disaster preparedness and resiliency, has tapped into this need for a tool that provides a wide variety of critical applications. With their continuous research and dedication to developing the best products on the market, the company has recently launched its newest product: the Surviveware Fire Starter Kit. The company’s Fire Starter Kit’s main feature is the 100% durable Ferro Rod that guarantees 15,000 strikes. This feature allows even beginners to maximize the tool and use this kit effortlessly. Apart from its robust width, the rod is lengthy, allowing for long, swift strokes to create sparks. Such a feature makes it an ideal tool for creating flames effortlessly. The kit also comes with a whistle and paracord. The added items have given this kit a wider variety of applications in the forest. 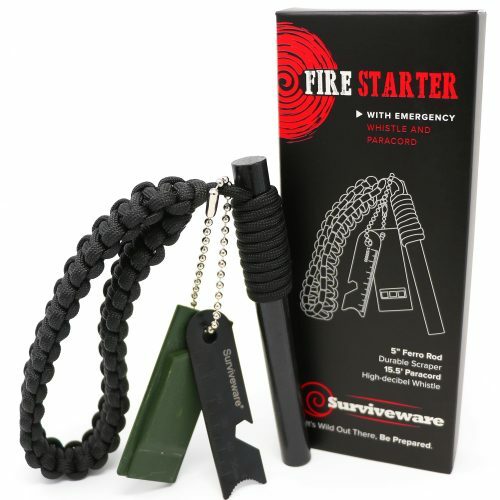 Surviveware’s Fire Starter Kit adds more value to any survival pack. With its top-of-the-line features and survival-friendly design, even beginners who are learning the ropes of camping, hiking, and survival preparedness can enjoy using this product. To ensure survival enthusiasts have the option of purchasing a functional and user-friendly fire tool, the company is giving away 20% discount coupons to the first 100 campers, hikers, and survivalists to use the promo code. Get this limited offer by clicking here today and purchasing your own Surviveware Fire Starter Set.